Like any surface that is exposed to the environment, stainless steel can get dirty. Dirt and soil, hard water stains, surface rust, fingerprints, shop oils, and grease are just some of the contaminants that require the cleaning of your stainless steel product. For basic maintenance of fingerprints and water spots, use a stainless steel cleaner such as "Stainless Magic" or "Sheila Shine" and wipe with a soft cloth. Tougher stains like oils and surface rust may require the use of a Scotch-Brite pad, a little soap or mild detergent and warm water, making sure to wipe in the direction of the grain. Wiping against the grain will cause small surface scratches to emerge. This method is to be used only on brushed finishes and is not to be used on polished or swirl surfaces. The abrasive nature of the pad will scratch the surface of a polished or swirled finish. Instead, use a soft cloth with mild soap, stainless steel polish, or car wax and buff stains out. Do not use bleach or steel wool to clean stainless steel. Some of the fine particles can lodge in the surface of the stainless and will eventually rust, giving the appearance that the stainless itself is rusting. Do not let acidic food items remain on your stainless surfaces for any length of time. If they sit on the stainless for a long period of time, they may "bleach the surface". You may rub out this "white" area with a very fine Scotch-Brite pad making sure to rub with the direction of the grain and not against it. Want to Know About Stainless Steel? Stainless steel is not a single alloy, but rather the name applies to a group of iron-based alloys containing a minimum of 10.5% chromium. Other elements are added and the chromium content is increased to improve the corrosion resistance and heat resisting properties, and/or improve fabricating characteristics. 304 is the basic chromium-nickel stainless steel and has a been found suitable for a wide range of applications. It is the most readily available in a variety of sizes and shapes. 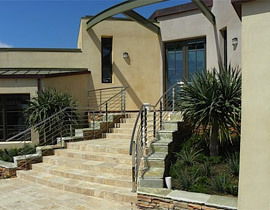 This grade is easy to form and fabricate with excellent resistance to corrosion. 316 offers more corrosion- resistance through the addition of molybdenum. This grade is desirable where the possibility of severe corrosion exists, such as heavy industrial areas and marine environments. Forms of Stainless Steel: Sheet, Strip, Plate, Bar, Wire, Angle, Pipe, and Tubing. Finishes: Brushed, Swirl, Polished, and Perforated. 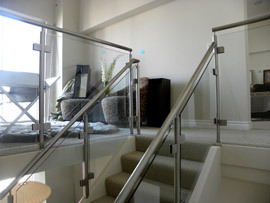 Forms and finishes of the stainless steel listed above are available in a wide variety of sizes. Rinse your stainless steel sink with fresh water after every use. After rinsing with clean water, use a cloth to wipe the sink while the water is still running. This will help to remove sticky food residues from the sink. After rinsing the sink, use a clean, dry cloth or a paper towel to dry it. If the sink is not manually dried after rinsing, minerals in the water will dry on the sink and leave unsightly white water spots. If hard-water deposits already exist on a stainless steel sink, dissolve them by saturating a cloth with full-strength white vinegar and rubbing the vinegar into the water spots. After the hard-water marks are removed, rinse and dry the sink as recommended. Deep clean the stainless steel sink every week with a gentle, abrasive cleaner. Scrub along with the horizontal grain lines to avoid scratching the stainless steel. For an inexpensive and effective abrasive cleaner, sprinkle baking soda over the sides and bottom of the sink. Moisten a cloth with clean water and rub the cloth over the baking soda to scour the sink and polish it. Rinse well and dry with another clean, dry cloth to finish. Never scrub a stainless steel sink with steel wool. Tiny steel wool fibers will remain in the stainless steel and rust over time. Use a synthetic cleaning sponge to scour the sink. For extra cleaning power, use the synthetic sponge to scour sprinkled baking soda. Strong, harsh chemicals can be effective for cleaning difficult stains or residues from stainless steel sinks; however, it is imperative that the chemicals be completely rinsed from the sinks. Otherwise, corrosion may occur. Never allow bleach to sit for an extended time in a stainless steel sink. 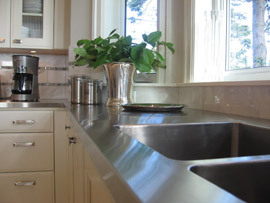 Stainless steel sinks can be sanitized with chlorine bleach as long as the bleach is rinsed right away. Do not place rubber mats in the bottom of stainless steel sinks because they can trap chemicals and lead to corrosion. © House of Stainless. All rights reserved.